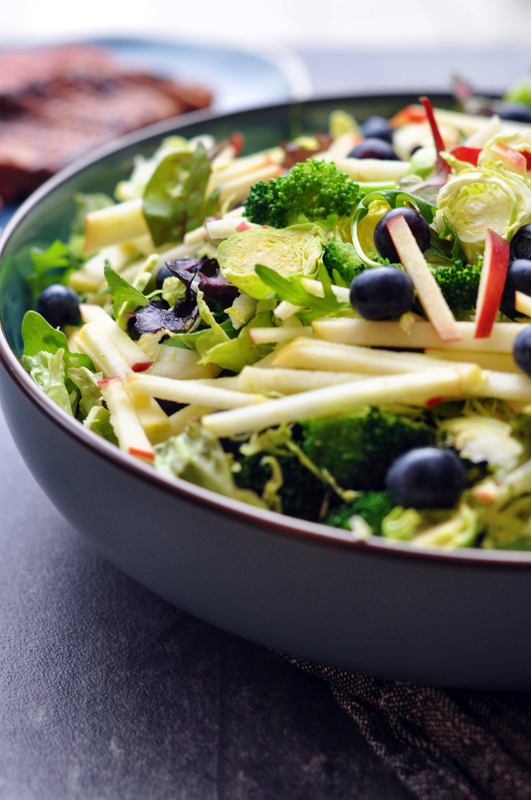 Anyways, about the salad – It is pretty straight forward to make! And you have to start with getting the duck breast cooking. 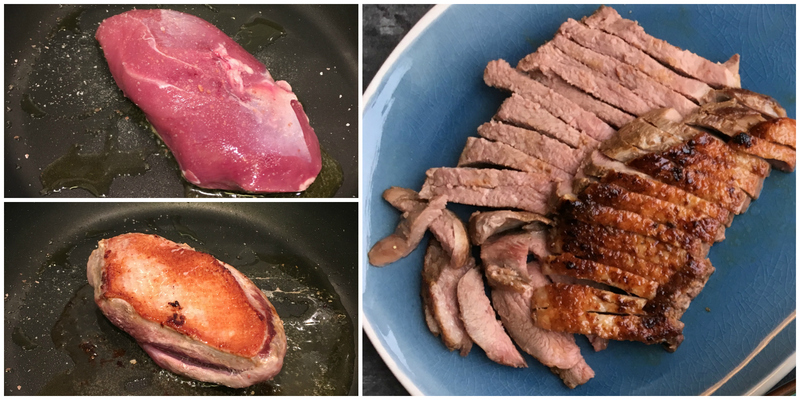 The time needed for cooking the duck breast, depends on the size of the duck breast and on how well done you want it. I prefer mine to be on the well done side of medium. Does that make any sense???? Let me try again! I prefer it to be cooked a bit longer than medium, but not completely well done. As this is all a bit relative, this to me means that the meat is cooked all the way through, but still has a slight hint of pink coloration. This for me means about 30 minutes of cooking time on low heat for a duck breast of 200 g (7 oz). If you still don’t know what I mean. I tried to illustrate it with pictures. Heat up a little olive oil and sprinkle a little salt onto the middle of your pan where the duck breast will be. Place the duck breast skin down (you can of course remove the skin if you want, I have read multiple places that the skin is higher in histamine than the meat), and sprinkle some more salt on top of the meat. Let it brown on low to medium heat for about ten minutes. Then turn the duck breast around and give it another 20 minutes on low heat. Note if you want it less “well done”, cook it for a shorter amount of time. 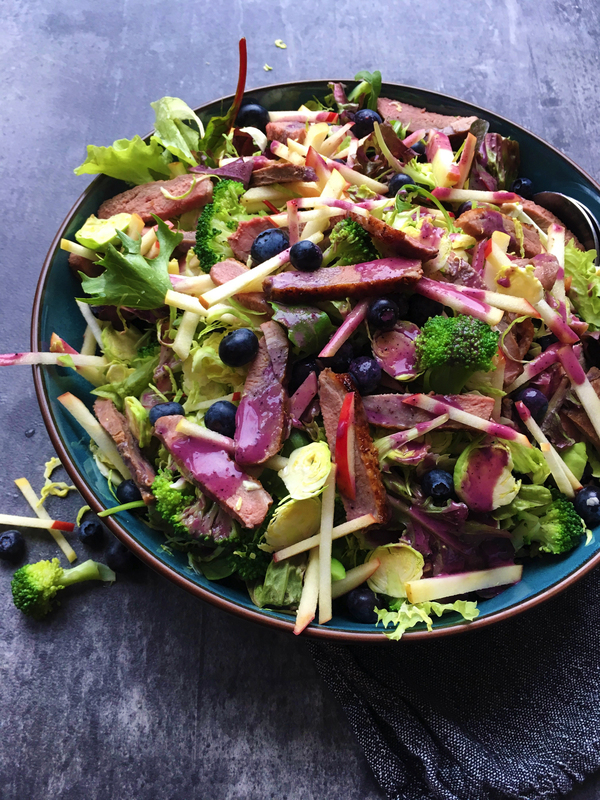 And finally for the blueberry dressing 🙂 Add apple juice, olive oil, dried blueberry powder, almond butter and a pinch of salt to a little container with a liquid proof lid. 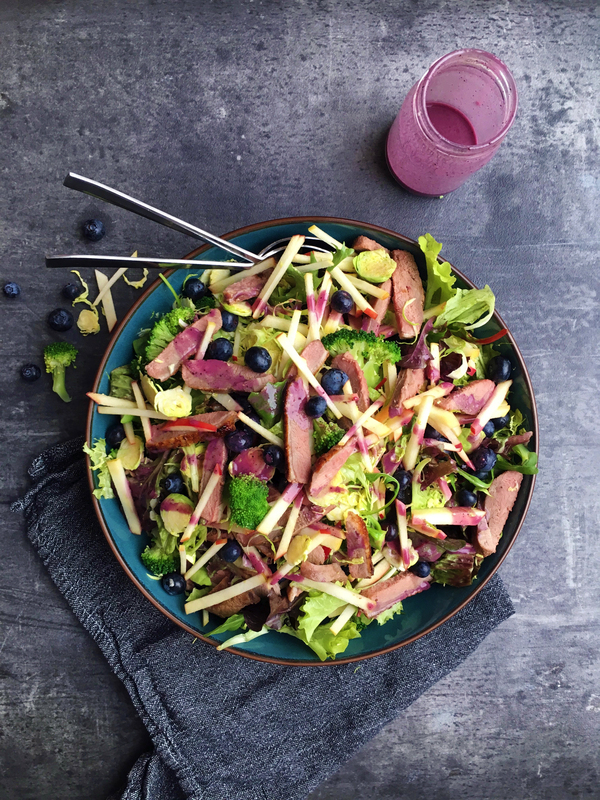 Shake it all up, and hoopla you have a blueberry salad dressing for your Histamine Friendly Blueberry Duck Salad. 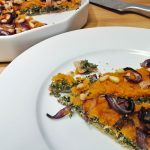 The almond butter is mainly added to give it some creaminess and body. If you don’t tolerate almond butter you can either leave it out, or replace with another tolerated nut or seed butter. 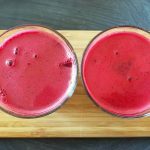 Tiger nut butter or apple sauce can also be used for a nut and seed free dressing. Heat up a little olive oil and sprinkle a little salt on to the middle of your pan where the duck breast will be. Place the duck breast skin down, and sprinkle some more salt on top of the meat. Let it brown on low to medium heat for about ten minutes. Then turn the duck breast around and give it another 20 minutes on low heat. Note if you want it less “well done”, cook it for a shorter amount of time. While the duck is cooking, clean and prep your vegetables. Cut the florets of the broccoli into bite size pieces, place them in a bowl and cover them with boiling water. 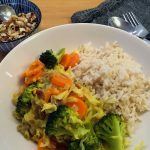 Let the broccoli florets stand for a couple of minutes, and when they have turned bright and vibrant green, pour off the hot water. Rinse with cold water, strain and let them drip off in a sieve. 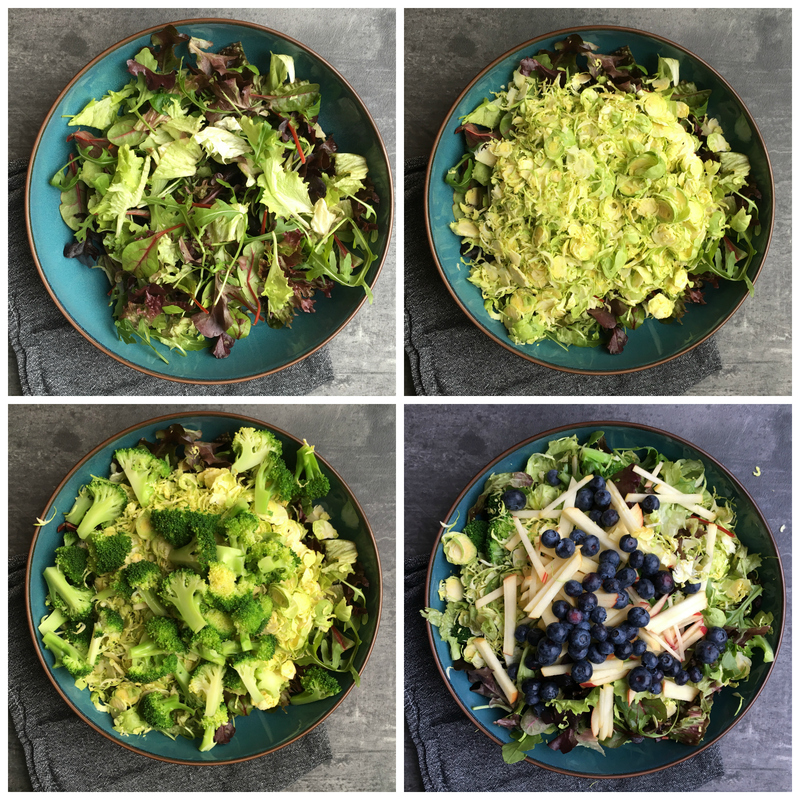 Wash and (spin) dry the mixed salad leaves. Remove the outer most layer of leaves from the Brussels sprouts and shave off the outer most part of the stem. Rinse them and slice them up finely. I’m a bit too lazy for this, so I use my food processor for this step. Clean and slices up the apple into thin matchsticks. Rinse the blueberries and gently pad them dry. 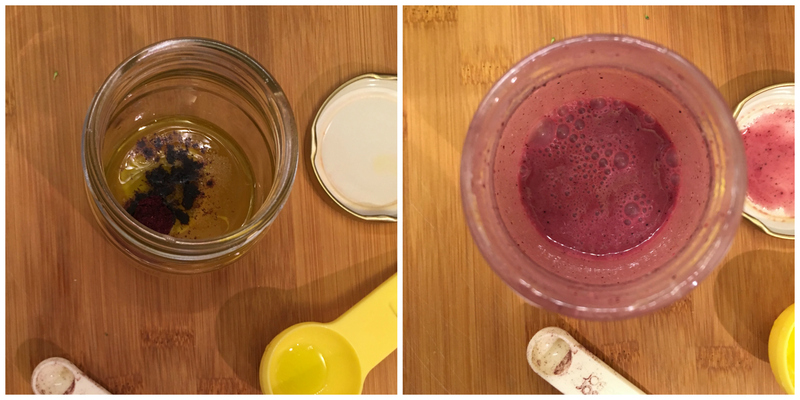 Add apple juice, olive oil, dried blueberry powder, almond butter and a pinch of salt to a little container with a liquid proof lid. 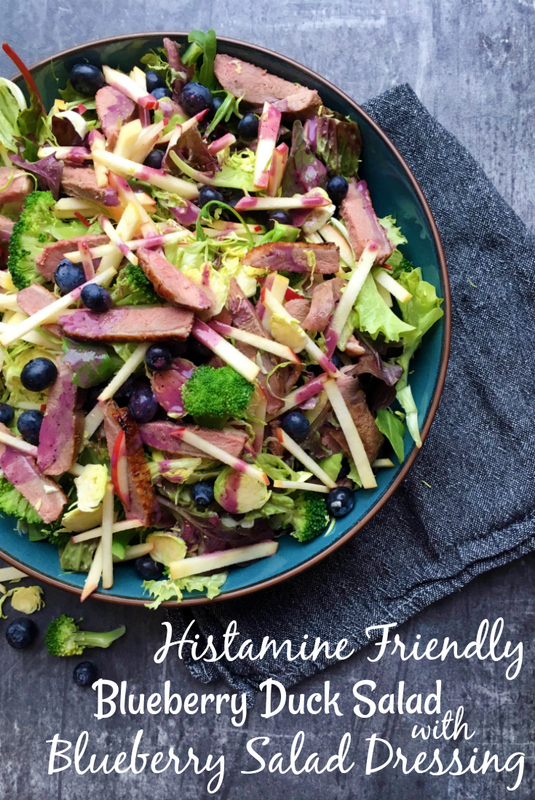 Shake it all up, and hoopla you have a blueberry dressing for your Histamine Friendly Blueberry Duck Salad. 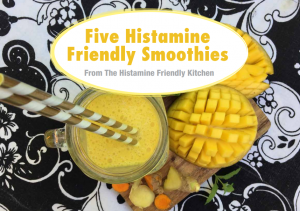 Since the skin is supposedly higher in histamine than the meat, you can of course remove the skin if you want. 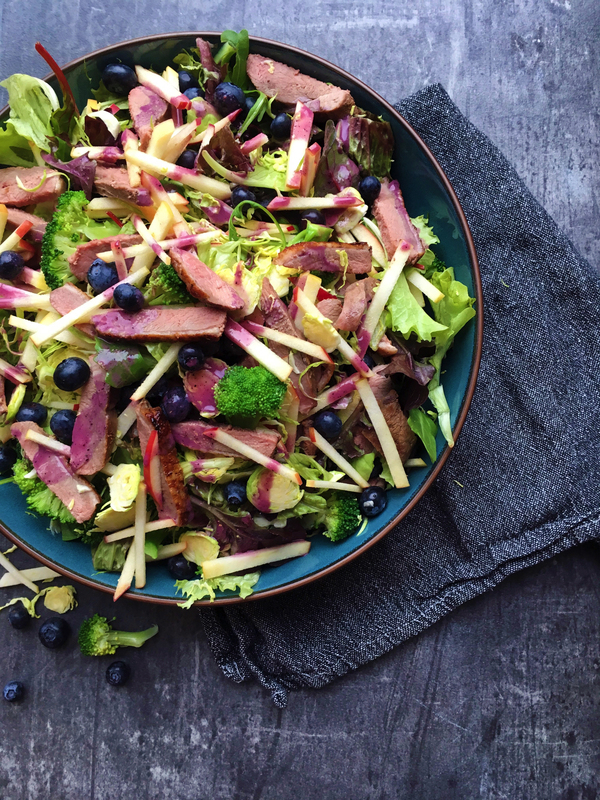 If you don’t tolerate duck, you can replace it with chicken, turkey, quail or even beef. 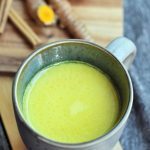 The almond butter is mainly added to give it some creaminess and body. If you don’t tolerate almond butter you can either leave it out, or replace with another tolerated nut or seed butter. 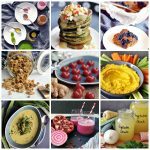 Tiger nut butter or apple sauce can also be used for a nut and seed free dressing. The nutritional data is calculated based on one portion out of two. 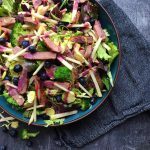 Save this HISTAMINE FRIENDLY BLUEBERRY DUCK SALAD WITH BLUEBERRY SALAD DRESSING recipe for later 😉 Pin It!